Iran's Video Surveillance Market has been divided into three segment markets i.e. Analog Video Surveillance Systems (Analog Cameras and DVRs), Network/ IP Video Surveillance Systems (IP Cameras, Encoders/ Decoders and NVRs) and Video Surveillance Software (VMS and Video Analytics). 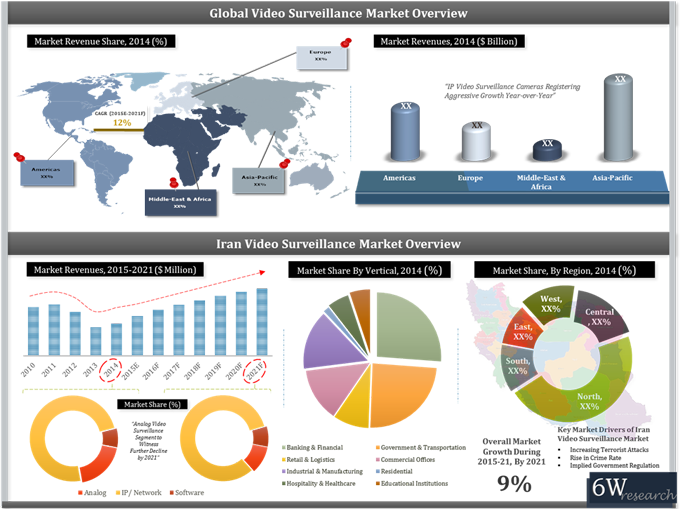 According to 6Wresearch, Iran's Video Surveillance Market is projected to grow at a CAGR of 9.2% during 2015-21. The market declined drastically after the imposition of sanctions on the country. However, the market registered positive growth in 2014 and is anticipated to grow in the coming years due to improvement in the economy, rising security concerns predominantly terrorist threats and surging FDI. In Iran's video surveillance market, IP video surveillance segment captured major share of the market pie. Amongst all the verticals, banking & financial acquired largest revenue. Over the next six years, industrial and hospitality verticals are forecast to grow at relatively higher CAGR from 2015 to 2021. 13.4	Zhejiang Dahua Technology Co. Ltd.
13.5	Hangzhou Hik-Vision Digital Technology Co. Ltd.
13.8	Samsung Techwin Co. Ltd.
Iran Video Surveillance Market is recovering after declining majorly during the period 2012-13. Iran witnessed major sanctions on international trade, which tremendously affected its economy and resulted into devaluation of the Iranian currency and rise in prices of commodities including video surveillance systems. In 2014, video surveillance market in Iran registered slight improvement due to ease of various sanctions and further resulting improvement in imports. The major companies in Iran video surveillance market include- Avigilon Corporation, Axis Communications, Bosch Security Systems, Dahua, Hikvision, Mobotix, Panasonic, Samsung, Sony and Vivotek.